The calming effect of dogs and puppies was experienced by the students of Bainbridge State University, located in Bainbridge, GA. 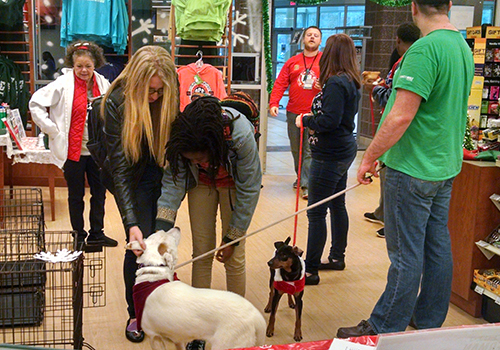 The dogs were brought into the bookstore as part of their DeStress Fest, held during finals. 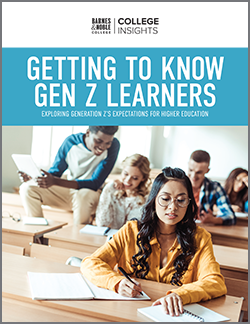 The closing weeks of the fall term can be extremely challenging for students, especially with studying for final exams, planning for the holidays, and preparing to head home for the winter break. 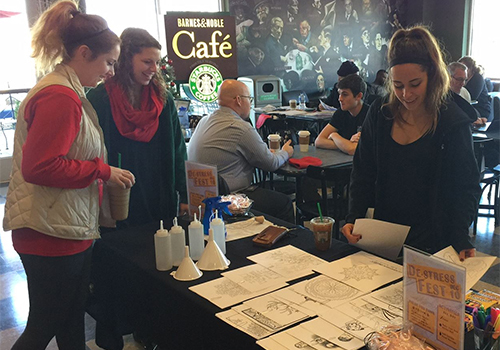 This December, Barnes & Noble College campus bookstores helped ease that strain with De‐Stress Fest events held nationwide. 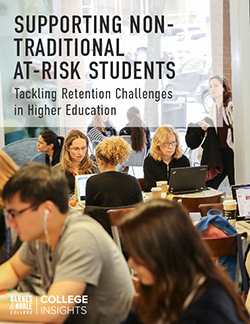 The events allowed students to take a break from studying and unwind with fun and relaxing activities. 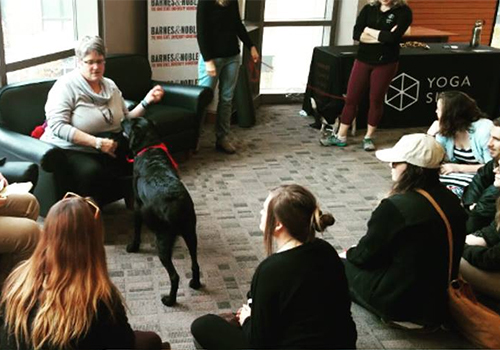 The De-Stress Fest events differed on each campus and included chair massages, petting zoos, games, photo booths, food and refreshments, and puppies …. lots of puppies. 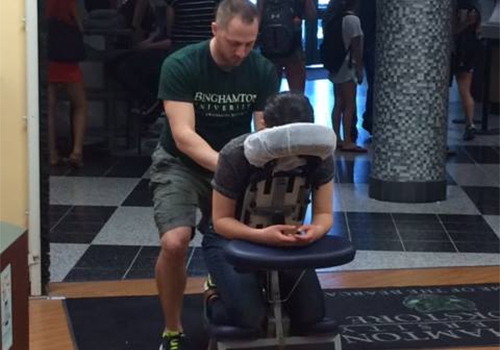 A Binghamton University student receives a massage at the campus bookstore during its De-Stress Fest. Binghamtom University is located in Binghamton, N.Y. 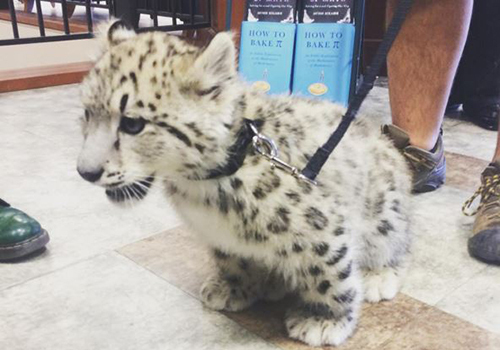 The Barnes & Noble at The Ohio State University brought in exotic animals, such as this baby snow leopard, for its De-Stress Fest for students to interact with during finals week. The bookstore is located in Columbus, OH. 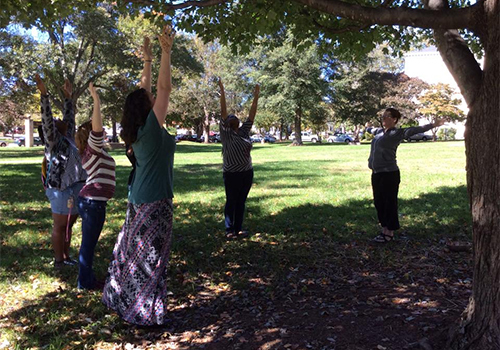 Brenau University, located in Gainesville, GA, offered its students a free yoga class as part of the bookstore’s De-Stress Fest. 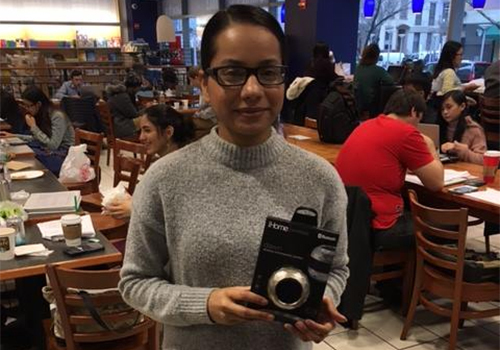 Baruch College student Ms. Kaur won an I-HOME from the bookstore’s raffle at their De-Stress Fest. The bookstore is located in New York City. 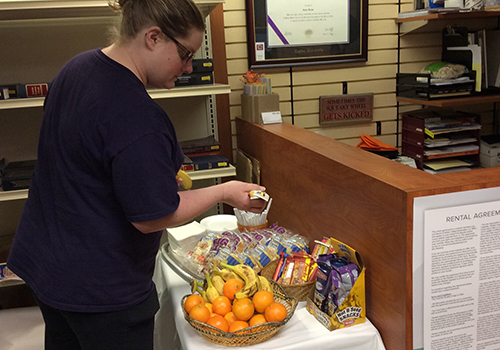 Healthy snacks were offered to students during finals week at the Capital University Law School Bookstore, located in Columbus, Ohio. 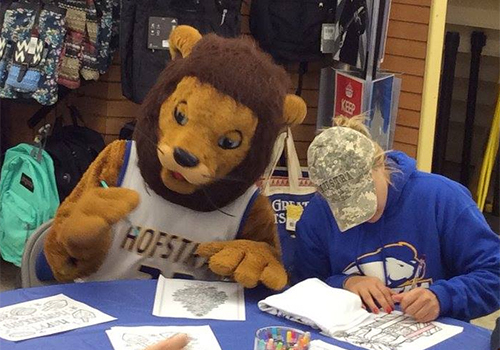 Willie Pride, Hofstra University’s mascot, took time out to color with a Hofstra student during it’s De-Stress Fest. Hofstra University is located in Hempstead, N.Y.
University of North Carolina Charlotte students enjoy some pizza and games at the campus bookstore’s De-Stress Fest. 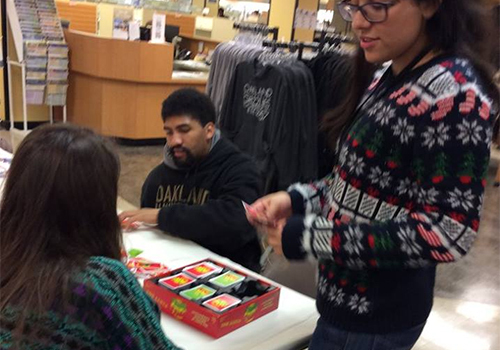 Liberty University students took time out from studying for final exams at the bookstore’s De-Stress Fest. 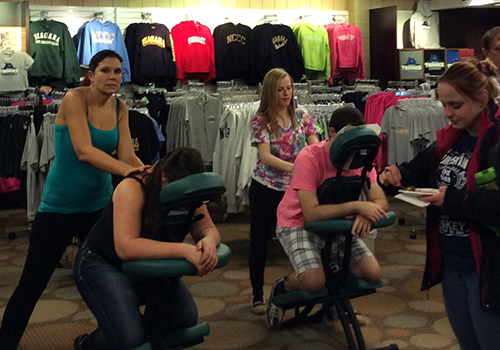 Liberty University is located in Lynchburg, VA.
Niagara County Community College students enjoyed relaxing massages in their campus bookstore as part of their De-Stress Fest. 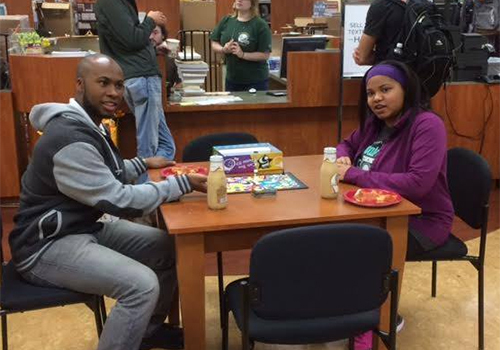 The bookstore, located in Sanborn, N.Y.
Oakland University students relaxed by playing a game of Apples to Apples in the campus bookstore.The bookstore’s De-Stress Fest was held during final exam week and offered students a chance to take a break from studying. Oakland University is located in Rochester, MI. 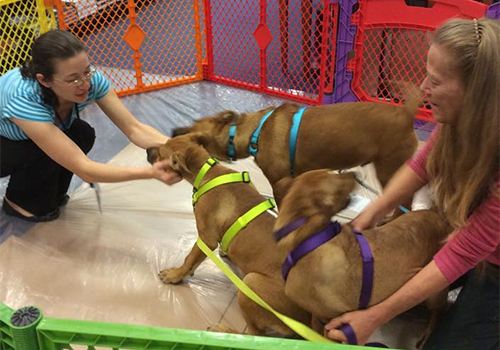 Ohio State University brought in services dogs for students to interact with during finals week. The bookstore is located in Columbus, OH. 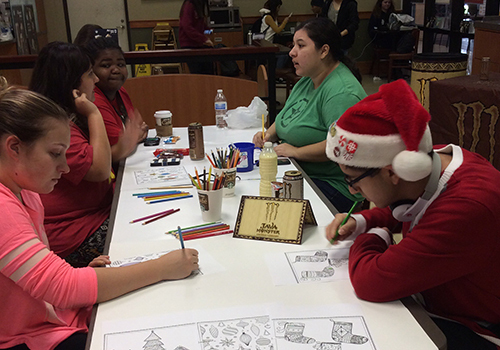 San Jacinto College South students relax by coloring at the campus bookstore’s De-Stress Fest, held during final exam week. San Jacinto College South is located in Houston, TX. Puppies werea big draw at the Southern Methodist University Bookstore during its De-Stress Fest. SMU is located in Dallas Texas. 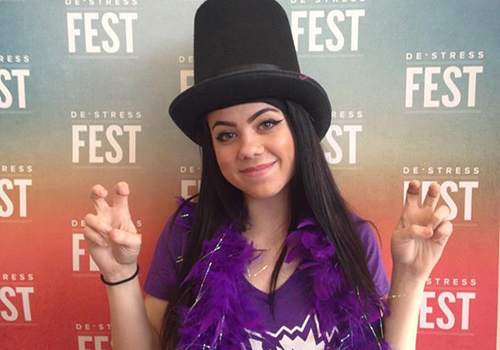 At the Texas Christian University (TCU) Bookstore, a student poses giving the Horned Frog hand signal. TCU is located in Fort Worth, Texas. 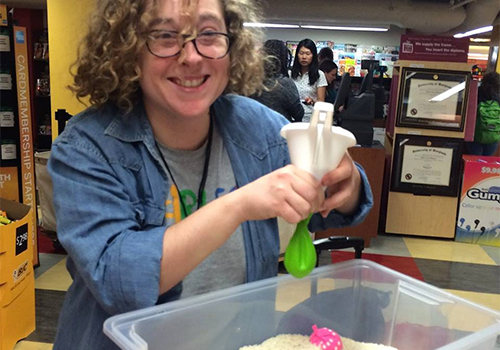 A student at the University of Maryland fills a balloon with sand to create a stress ball at its De-Stress Fest. The University of Maryland is located in College Park, MD. 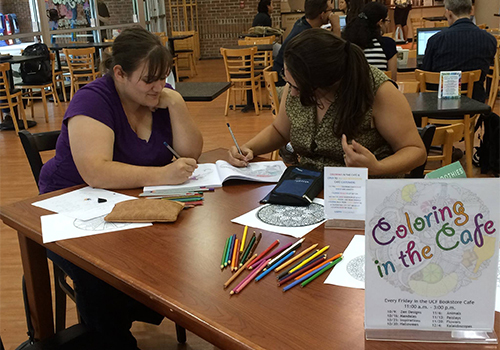 University of Central Florida students relax during finals week by coloring in the cafe at the UCF Bookstore, located in Orlando, FL.